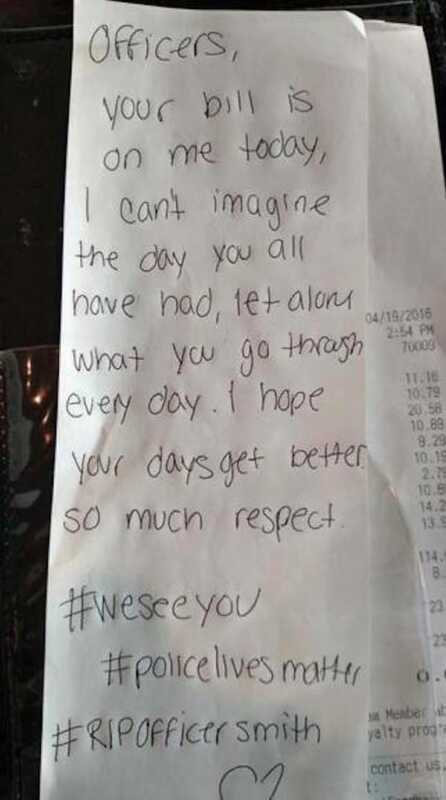 Red Robin Server Pays For Officers’ Lunch After Funeral..
After the funeral of Columbus, Ohio SWAT Officer Steven Smith, nine police officers who were in attendance went to grab some food at the Red Robin in Ohio. Their server that day was a mother named Jessica Dunbar, whose father is a retired police officer. She could tell there was sadness in the air. Something was “off.” So, she asked them if they had had a rough day. “It’s always a rough day when you’ve gotta put a brother in the ground.” That’s when she realized the men had just left Officer Smith’s funeral. The death of Officer Smith made Jessica think about her own family. She grew up watching her mother cope with a husband putting his life on the line every day, and she understands how this type of horrible tragedy could have happened to her own dad. Jessica knew she had to do something. The officers finished up their meals, but when they looked at the bill — a total of 123 dollars — they were stunned. And that’s before they even flipped it over and saw what was written on the back. 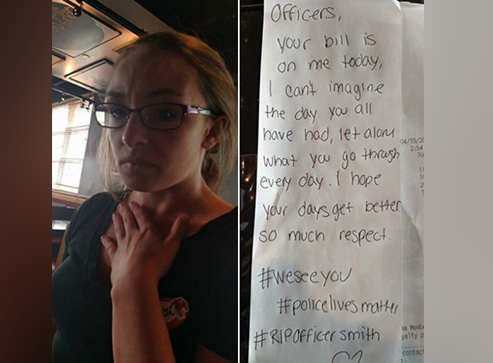 In April 2016, Jessica Dunbar headed into Red Robin where she works as a server. She expected an ordinary shift, but it turned out to be anything but. Later that day, Jessica noticed a group of nine police officers seated at one of her tables. 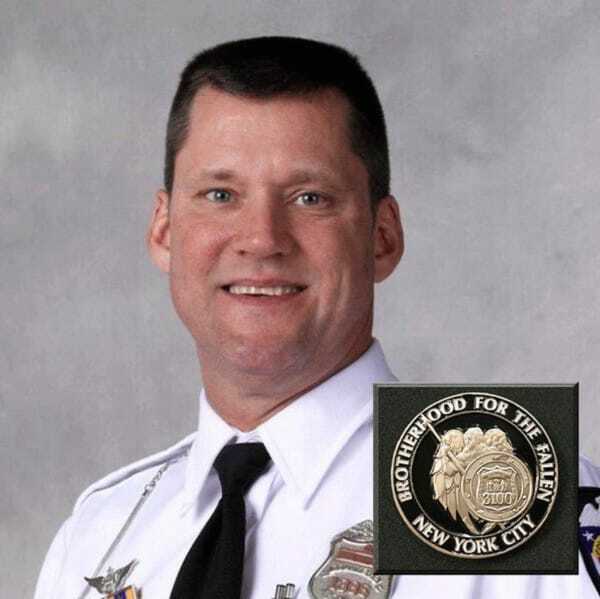 SWAT Officer Steven Smith was shot during a standoff. He passed away two days later, leaving behind his wife and children. Thousands of people attended his funeral and hundreds of police vehicles from nearly 120 jurisdictions were part of the procession. After leaving Officer Smith’s funeral, the nine officers went to grab lunch at Jessica’s restaurant. Her own father is a retired police officer, and with children of her own she couldn’t help but think of her own family — and how these officers risk their lives every day to protect others. …Jessica decided it would be on her. The unexpected act of kindness is now going viral, and the officers say the gesture touched all of the hearts. “To have them shake my hand and say ‘thank you’ to me, that was incredible,” Jessica told NBC. Please SHARE This On facebook With Your Friends & Family.. This post was republished from wthr.com. You can find the original post here.